The community gathered to remember an 11-year-old girl who was killed in a shooting in North Las Vegas. There wasn’t a dry eye along Courtney Michelle Street Saturday night. The community, with candles in hand, remembered Angelina. Police say suspected gang members shot her multiple times while she was inside her home. They were outside and started shooting at the home. Police believe they targeted the wrong house. “Those bullets weren’t meant for my baby girl," said Angelina's father. He spoke out for the first time at the vigil with Angelina's mom and sisters by his side. They were unable to grasp how this could happen. “We don’t do harm to no one, we live by Christ as much as we can. Everyone that knows her knows how big her heart was,” family members said. The vigil wasn't only to mourn but to remember the incredible person Angelina was. Her cousin Miguel Nunez was touched by the outpouring of support Saturday night. “When tragedy struck we all came together and it makes me more happy and proud of the community we grew up in,” Nunez said. The family now faces a long road ahead, but they've got a community that has their back. 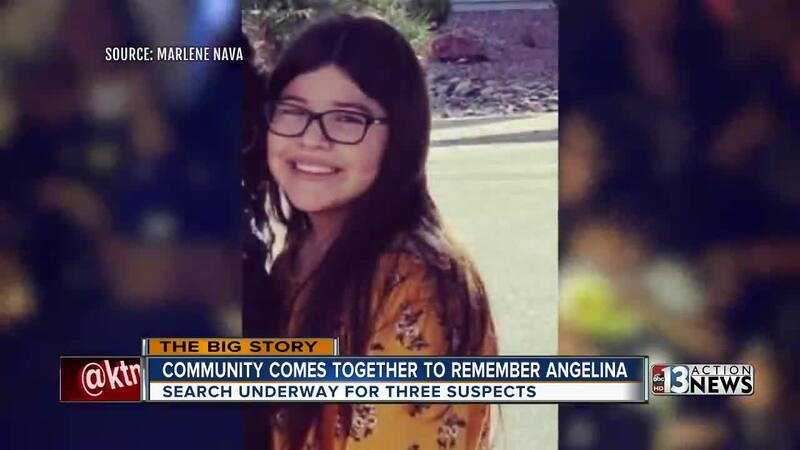 “I don’t know if it's going to be a week, or if it's going to be a year or a decade, but we’ll get through this okay, we’ll get through this," Angelina's father said. Police say three suspects believed to be involved in the shooting are still out there. The family was pleading for anyone with information to give North Las Vegas police a call.